Kijabe Hospital rests on the steep slope overlooking the Great Rift Valley. The picture was taken from our bedroom window peering above the trees to see Mt. Longonot. Mt. 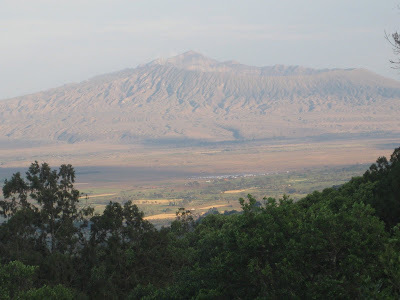 Longonot is a young volcano rising to 2776 meter above sea level. It is thought to have last erupted in 1860. Longonot means a mountain of many spurs or steep ridges. Is is a national park and just short drive from our house. A favorite day hike of visitors goes up the mountain and then circumnavigates the crater rim. I have not yet made this hike and am just waiting for some visitors to join us. I like everything about bicycles including road bicycles, mountain bicycles, tandems, recumbents (never tried a unicycle). Bicycling in Kenya unlike in the United States is not for sport or exercise. 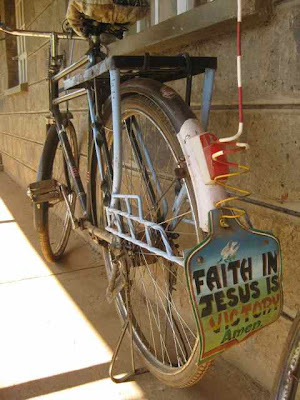 People ride here bikes in Kenya to get places; work, church, the dukas (shopping). It is not uncommon to see on one bike several crates of soda bottles, a pile of sticks, and often an extra passenger. Bikes are tremendously useful as they can save Kenyans time and effort as they get from home to the places they go. 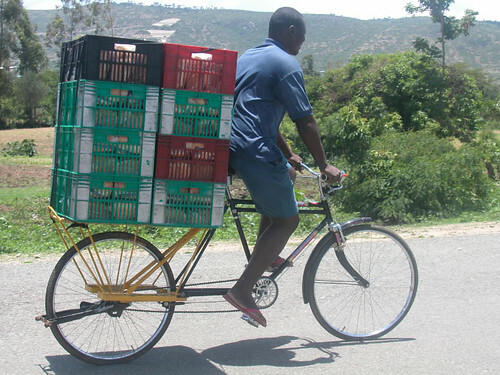 Bicycles in Kenya are like a traditional road bicycle on steroids. They must weigh well over 60-70 lbs, frames built with steel, usually black in color, double cross bars, and every junction is welded. As you can imagine these bikes take a beating after all the potholes they encounter. I liked the bike above with the padded seat and the evangelical license plate. It belongs to one of the guards at the hospital. This picture was taken near the escarpment on the way to Kijabe. This biker was hitching a ride by grabbing on to a passing truck. 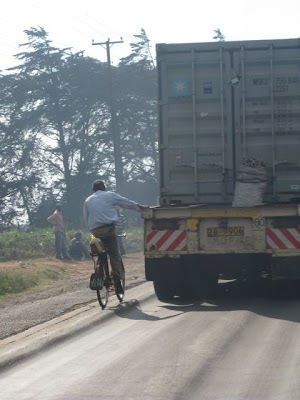 Although obviously dangerous, I can't blame this man as the road to Kijabe climbs 3500 feet in less than 10 miles. "Flower, I got you tight," Meredith will say. This advertisement caught my attention (really fear) in front of our Butcher's Shop in Nairobi where we typically buy our ground beef, pork, chicken, and occasionally tilapia. The questions came to my mind; What is Katakata (dog meat or meat fed to dogs)? Secondly; what kind of meat can be sold at 30 Ksh (about 40 cents) per kilogram? 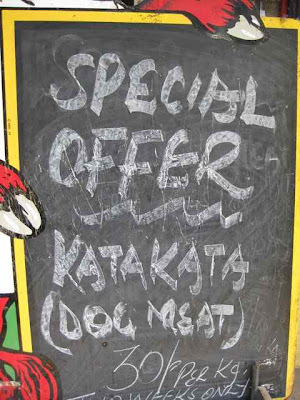 My curiosity prompted me to purchase 10 kg of Katakata (whatever type of meat it is it sounds like a bargain)! Katakata I found out means cut, cut. Thankfully the butcher informed me that Katakata is indeed meat to be feed to dogs and not dog meat and mostly consists of pork bones for dogs to chew on. Mocha our dog is quite happy chewing and burying her Katakata this week. My mind and GI tract are at rest. Cross-cultural Sunday in Kenya included dancing, singing, and presentations from some of the 45 tribes in Kenya and nearby countries. This video represents the Masai men dancing and praising Jesus through a traditional style of celebration. Perhaps we'll all be learning this in heaven. The girls are always excited when a package arrives. 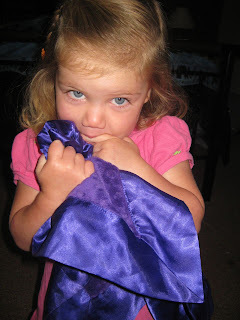 Meredith was particularly thrilled to get a new blankie in the mail from Grammie. Amelia is excitedly opening her BD presents that came in that package as well. Unfortunately not everything mailed remained in the package. It seems the custom officials did some "shopping" in our package and the warmer clothes for Malin and I didn't make it. So, we've recommended to our family to send stuff with visiting doctors coming to Kijabe. There truly are people coming and going every week! 'Z" was our cat for 6 days. I'll probably upset some feline friendly people but I do not like cats. I'm allergic to cats. My eyes turn red and throat becomes scratchy around these animals. 'Z" was not destined to last long at our house. He hissed, scratched, and found his way on to our bed despite shutting doors again and again. Thankfully Sara our househelper was happy to take home such a fat animal to keep the rodents away. 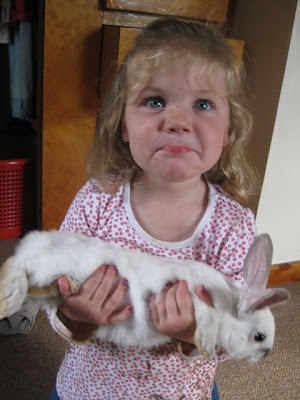 Amelia is of course sad to have to say goodbye to this pet, but perhaps another bunny for her in the future. 1) E-mail regularly (news, pictures, church updates). 2) Personal Letters (thank-you, encouragement). 3) Telephone calls (hearing a familiar voice means so much this far away). 5) Forwarding on mail of church newsletters, cards, etc. 6) Remembering Birthdays and Anniversaries. 7) Forwarding Magazines and initiating subscriptions. 9) Adding comments to our blog and following our story. 10) Visiting us in Kenya. (Adapted from Africa Inland Mission brochure on caring for missionaries). I write this not as instructional but as a thank-you to our family, friends, and churches that support us each day. You are so graciously providing all these measures of support to our family perhaps without even knowing how important your acts have been. 1) We daily receive e-mail messages from family and friends. So many some times we apologize when we are slow to respond. 2) Cards from family and friends are well appreciated. 3) Cellular phones are common in Kenya and we love receiving news about marriages and new cousins. 4) There are many praying for our ministry here in Kenya, and many praying that we don't even know about. Thank-you. God is present when we pray. 5) We regularly receive news and encouragment from our 3 supporting churches Westminster Presbyterian, First Reformed Church, & First Baptist Church. 6) Amelia's 6th Birthday is in two days and she awaits many cards and packages already arrived. She is excited! 7) I enjoy news and have appreciated the Newsweek magazines and Christianity Today that have found their way to Kenya. 8) The girls ask daily if we checked the mail box for packages! 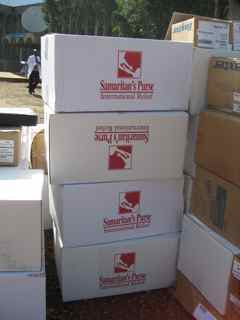 Thank-you for the time in effort in packing books, pop-tarts, toys for the girls, dvd's, etc. 9) Comments from the blog serve as a connection to you. Sara and I are uplifted by the variety of people many who we may not even know are following our ministry in Kenya. 10) Thanks family for the visits. We look forward to even more time together in Kenya in the future! 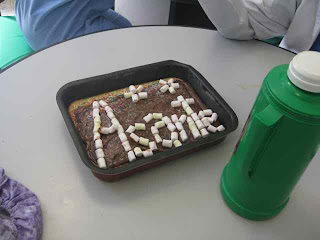 We would like to say as a family Asante (thank-you)! 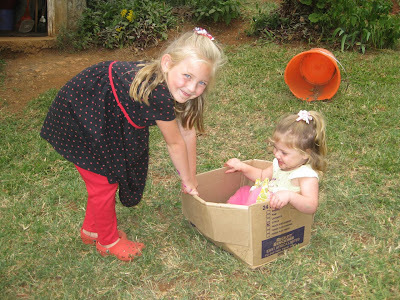 As you can see it is "winter" in Kenya and Amelia took the chance to put Meredith in a box and drag her down the hill. July & August are the coldest months of the year at Kijabe. Cold and Africa do not usually go together but at 6700 ft elevation the mornings and evenings are brisk and windy. The word Kijabe translates to Windy in the Kikuyu language. Nights drop in to the low 40's and often times during the day the temperature does not rise above 65 degrees. We are making use of the sweatshirts and few sweaters we have. A fire in the evenings also helps to heat our house. Doctor Friess we have a patient that is here to see you. Immediately one can notice her pursing her lips stretching to gain competence over the front teeth as if she was puckering her mouth after eating a tart fruit. "What has happened? "I asked. 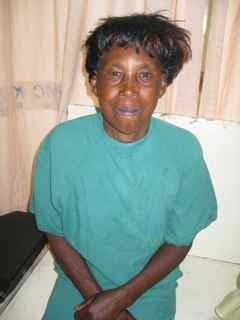 "I have been like this ever since I had my tooth removed in Northern Kenya," Martha said. "How long has that been?" I asked. "I think almost 2 months, and it is not getting any better. It hurts constantly" Martha replied. Martha relaxed her lips and showed this uncomfortable position. She is not smiling, eating, or intentionally opening her mouth. This is how she is locked. Matha's mandible would not rotate up or down. It was completely fixed in its current location. It was determined that the Temporal Mandibular Joint was dislocated during her unfortunate extraction. After nearly 2 months in this position scar tissue had likely formed within the glennoid fossa interfering with the desired location of the capsule and coronoid process. She could not close, open, or shift her jaw laterally even a few millimeters. 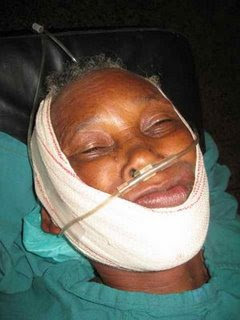 Typically for patients the TMJ will reduce on its own within hours but she had been less fortunate. I offered to Martha that we could attempt to reduce her mandible manually in the dental clinic. I began to press gently on her teeth and she winced in pain. The muscles were inflamed and much to tender. I gave her bilateral dental blocks of the mandible. I tried again several times to reduce her locked mandible, but got no movement. We stopped after many attempts with Martha in tears of frustration as she indicated she could not take the pain of the pushing even one more time. The next option was take Martha to Theatre for Sedation in hopes that the muscle relaxation induced by the anesthetic would give some mobility to her TMJ and allow her teeth to close. Reduction of the mandible involves putting bilateral pressure with the thumbs on the patients lower molars and pressing with lots of force downward and then backward. The TMJ is a joint that both rotates and slides. It has to be reduced over the eminence and so it can slide back into it's natural fossa where it can rotate up and down. Well I tried this procedure of pushing at least 20 different times in different directions and with differing forces unsuccessfully. I couldn't leave Martha like this..that is no way to live unable to properly eat, enunciate words, and in constant pain. I was unaware what of if a type of surgical coronoidplasty or condylarplasty might be an option? I offered a simple prayer of last resort as I had no other option. Soon thereafter repeated attempts of reduction and direct pressure on her dislocated coronoid and condylar process her teeth came together. We quickly wrapped Martha's head in an Ace Bandage securing her teeth in a occluded position. Martha was certainly pleased when she awoke. Strict instructions of no yawning, no eating hard foods, and no opening her mouth wide for several months were given. I hope not to see Martha again in her previous condition. It finally fell out while eating a tortilla. Amelia proudly rescued her tooth from swallowing and showed me with a big grin. 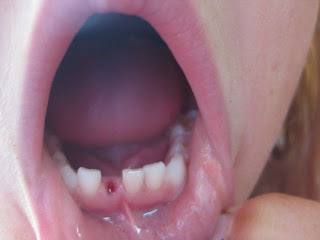 She also excitedly announced the tooth next to it is very loose too. 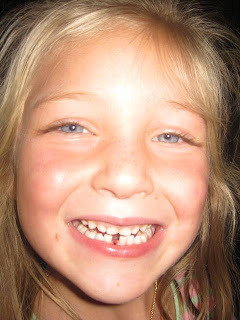 The tooth fairy left some shillings, but Amelia wished that that tooth hadn't been thrown away. I still remember sneaking into my mother's drawer to find a box full of teeth. Mom, do you still have my teeth? I hope you've gotten rid of them by now. 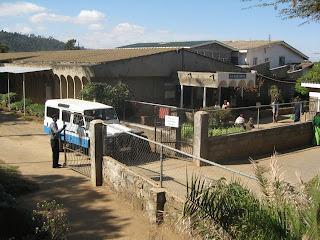 The first hospital at Kijabe mission station, Theodora Hospital, was established in 1915. This served the medical needs of the area until 1957 when church leaders sensed a need for a referral medical centre. In 1961, the first building of the present complex was erected and opened with a 65-bed capacity and a small surgical unit. By 1969, the second building was finished which included a 30-bed maternity unit, 3 private rooms and a well designed and equipped theatre. The three and a half year community nurse training program began in 1980, the same year that President Moi officially opened the new outpatient building. In 1991, the dental department began a two-year program for training Kenyan dentists. The most recent initiative which began in 1995 involves training Christian Kenyan doctors in a new Intern Training Program. 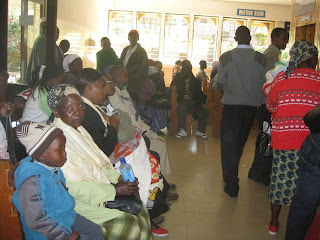 Kijabe hospital receives patients from all over Kenya and often the surrounding countries of East Africa. 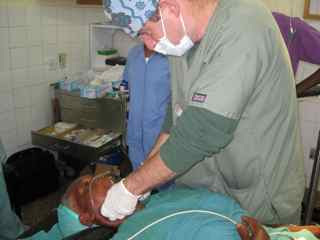 Kijabe currently trains medical students, family practice residents, and surgery residents. The inpatient wards run at 140% capacity. Construction will begin soon on 5 new theatres (Operating Rooms). Kijabe seeks to remain true to its motto to provide, "Healthcare to God's Glory." Her name is Flower and she now belongs to Amelia. 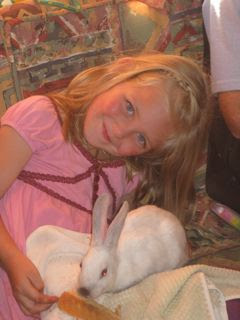 Amelia's love of animals exceeds my understanding. But we're beginning to see a bunny has some ease compared to other animals. They eat vegatable/fruit scraps, sleep on grass clippings, live outside, and we only got one because we didn't want to start breeding them (we were offered up to 5)! Something to nurture for Amelia as she transitions to summer break, we move to another house, and most long term people here leave for the next 5-6 weeks, will be a good distraction and comfort. 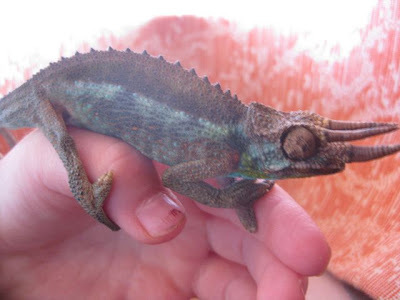 "The chameleons at Kijabe mostly have horns, when you find them they are always going to have horns. It's really tricky to find chameleons here. When chameleons eat flies its really tricky to make them eat. If they see the fly they stick out their tongue and pull the fly into their mouth real fast. But if they miss, the fly flies away. The chameleon lives on our curtains but once he got out, but he found his way back (much to Sara's delight!) through our window into our house. His name is Horny because he has 3 horns. If you were to visit and to hold Horny he might hiss and try to get back on the curtain. Once a chameleon bit me. But it did not hurt." This July until next June 2010 I am keeping track of every surgery I perform and patient I deliver. It's not that I want to keep a record, although I think looking back I will see God's hand in the healing of many people, but rather, I'm required too. In order to take the OB/GYN oral boards I must keep track. After 1 week, I'm finding just how challenging this will be. First, records are hard to track down. Second, I don't round on all 100+ patients I'm responsible for every day. Last, there are some things I'd rather not keep a record of. For example, in one week there was a uterus that ruptured, a patient that coded, an eclamptic patient who's baby died during delivery, an newly diagnosed HIV + patient with a rash that I can't figure out and therefore can't really treat, and a C/S last night that hemorrhaged from where the intern had performed the tubal. Nevertheless, the list is getting made and shaped by the patients brought to me at Kijabe. And although, it may not be the list I want, it is the one God ordained. Christian Mission hospitals & clinics depend highly on donations of medical equipment to survive. Generally there is no budget for capital improvements of hospital whether it be facilities or much needed equipment. One of the greatest challenges of a mission hospital is to provide highest standard of care with excellent equipment but also to serve the poor by providing affordable care. It is a compliment to Kijabe Hospital that patients often come from Nairobi bypassing larger more modern facilities to receive care in a mission setting because of 1) the Christian caring/compassionate staff to the patients regardless of race or tribe 2) excellent high quality care 3) well known fact that it is very affordable. This past several weeks we have been very thankful for the arrival of much needed donated items. Sara and I personally welcomed after nearly 8 months 3 heavy trunks of donated ob/gyn operative kits and various dental instruments. 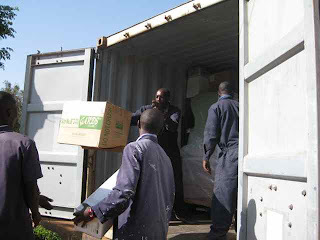 The items were packed months before we left and sent via ship to West Africa and just arrived last week via Air Courier to Samaritan's Purse Headquarters in Nairobi. We had almost forgot what we had packed inside these trunks. Kijabe (as you can see in the pictures) received a truck full of donated items collected and packed at Samaritan's Purse Headquarters in Boone, NC. I was told they were sent nearly one year ago via ship to Mombassa on the coast of Kenya. 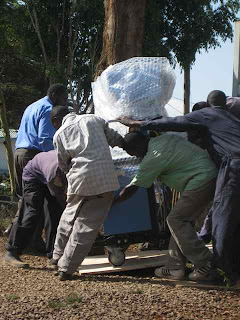 You can see the men unloading a much needed general anesthetic machine (I believe 3 in total arrived). I'm not sure what is included in the box the gentleman is throwing although the box reads, "Do not Crush" on the side. Regardless, it seems like we are always missing something and this will keep us from running on empty. 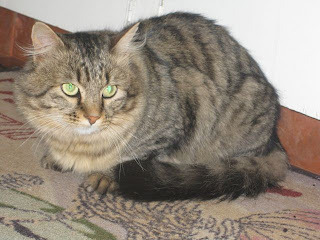 Meredith is still 2 years old but has never had a reasonable fear unlike her older sister Amelia. 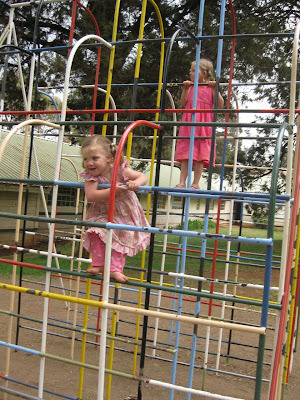 As a parent I've never exactly been told, how high can you let a 2 year old climb? Well, I spent a grand total of 11 dollars. In exchange I bought 5 shirts for Amelia, 3 shirts for Meredith, 2 dresses and 2 pairs of pants. Certainly cheaper than any Goodwill in the States. And now the girls have some warmer clothes. Just thought you might like to see the piles of clothing we had to look through to find the "good stuff." If you look closely at the picture with the guys in the white and blue tops, behind them is a bunch of white tents in the distance. These tents had the fruit/vegetable market. 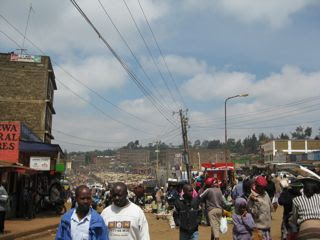 It was one of the largest markets I had seen here. But the kids were tired of looking so we left without looking. Fluorosis is defined as discoloration or mottling of the enamel due to too much fluoride ingestion (usually by water intake) systemically into the bloodstream. Therapeutic doses of fluoride (1 ppm) like those supplemented in the drinking water in many areas of the United States serve to strengthen the enamel in children in their developing tooth buds. If the doses of fluoride in drinking water exceed 1 ppm the therapeutic affects are lost and you begin to see the detrimental effects like those in seen here in my patient. I imagine 50 % of my patients have fluorosis some much more severe than this. As it turns out, the Rift Valley is quite renowned for the amount of fluorite deposits it contains. Fluorite is a calcium fluoride mineral that is typically found in hydrothermal deposits--basically the entire Rift Valley. It can occur in large crystal form or be nearly visible to the eye. It's very likely that since it's dissolvable, the river near your house is picking up fluoride as it flows over the basalt rocks. There isn't really anything you can do about that since it isn't a point source but rather occurs everywhere. Oddly enough, the WHO has found a connection with dental fluorosis and altitude. Even with similar fluoride concentrations in water, children at higher elevations seems to suffer more from dental fluorosis. Furthermore, the black tea sold in Kenya has abnormally high amounts of fluoride, probably due to growing the tea leaves in volcanic soils enriched in fluorite. And, when you boil water containing fluoride it works to concentrate the fluoride (not get rid of it as some people think). So, even though it seems like a national past-time in Kenya, drinking Kenyan chai is most likely contributing quite a bit to the overdose of fluoride in the population there. A case study in Tibet showed that dental fluorosis improved when people limited their black tea intake. Also, do people cook with coal in Kenya? It's also been proven that high-fluoride ash (from high-fluoride coal) can be breathed in or ingested on food (like grilled maize) and this contributes, too. Ana's explanation accurately portrays the habits of our area of Kenya. Black tea (chai) is taken at nearly every meal and in between, Kijabe and Tenwek Hospitals are at high elevation (over 6700 ft), people commonly cook with coal, drinking water is usually taken from the river or boar holes, and maize is a staple food. 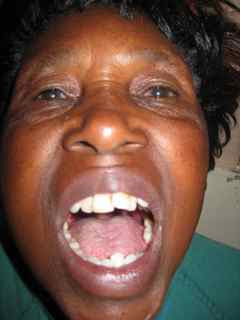 All of these additive habits cause fluorosis in the population in this area of Kenya and also in many missionary kids. Is it treatable? The stains are somewhat intrinsic and difficult to hide. A procedure called "masking" entails removing the outer layer of enamel and hiding the stain with a thin layer of composite has reasonable results. 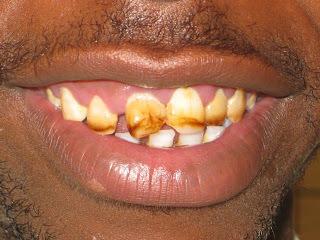 Interestingly enough I once asked one of my co-workers Erick an Oral Health Officer what the Kenyan's believed caused this staining of their teeth. "Eating hot potatoes causes your teeth to turn brown." Thanks to living near a large missionary school, there are 4th festivities planned. This evening the elementary school is having a skating party with hotdogs, hamburgers and it's been rumored even fireworks. Amelia has practiced her skating and decided skates are best used on grass, which is much softer to fall on. Meredith is upset that the skates are too big for her. She is in a constant struggle to keep up with Amelia. I'm going this morning to a clothes market with some other women. It's a lot like a flea market, but some things are actually new. 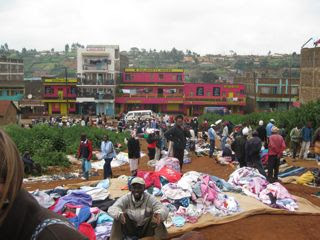 We did not bring enough warm clothing for Kijabe! I'll try to take some pictures to post later. Happy 4th! Telling a family about a death is always a challenge. Particularly when the death is not expected and I don't speak enough Swahili to explain what has happened. Yesterday, I coded a woman who another colleague had done a hysterectomy on because of chronic pelvic pain. The woman just stopped breathing and I suspect had a massive pulmonary emboli that caused her death. When her husband, brother and friend arrived later to see her, myself, the nurse in charge and 2 chaplains, gave them the news. This was the first death in maternity in over 18 months. Very different from my experience at Tenwek where we had several maternal deaths a month. I'm grateful for the comfort and presence the chaplains provide because inevitably I'm paged as the family is grieving and need to leave.